Crews remove bricks from Booker T. Washington High School’s auditorium earlier this month. The historic high school was torn down, but its auditorium and entrance were salvaged and will be incorporated into a new school. Booker T. Washington High School, the first high school built for black students in New Orleans, was added to the the National Register of Historic Places in 2002 because of its architectural and historical significance. But now, with just the auditorium and the school entrance remaining, the site is no longer a historic landmark. It was removed from the register earlier this year. “Unfortunately, I suspected that was probably going to happen,” said Wayne Jones, the alumni association president. His class was the first to graduate in caps and gowns — white for women, crimson for men — rather than the traditional white dresses and black tuxedos. He and his classmates had to lobby hard for that. Jones said the class of 1965’s stroll across the stage was a memorable moment for him in the high school’s historic auditorium, which served as the city’s black municipal auditorium for decades. In 2002, on the 60th anniversary of its opening, the high school was added to the National Register of Historic Places. “At the time of listing, the campus had been altered very little since its opening in September 1942 and it easily conveyed its local historical significance,” said a report submitted for taking it off the historic register. Three years later, the school was severely damaged by Hurricane Katrina. When its renovation was planned after the storm, it was the most expensive school rebuilding project, according to the Times-Picayune. The state and the local school board decided to demolish most of the vocational school but spare the entrance and auditorium, which would be incorporated into the new school. A 2011 agreement between the Federal Emergency Management Agency and state agencies acknowledged the work could jeopardize its standing as a historic site. The Recovery School District still plans to restore the auditorium, but without the school, its historic significance is diminished. Jones said he was “disappointed, but not surprised” when told the property had been taken off the list of historic places. The school’s auditorium, for years the only large venue open to African-Americans, will be restored. The three-story high school was designed in “severe Art Deco” style and veneered in dark brown brick, according to the report to remove the school from the Register. It was funded by the federal Works Progress Administration after the local school board failed to provide promised money, according to the Preservation Resource Center. 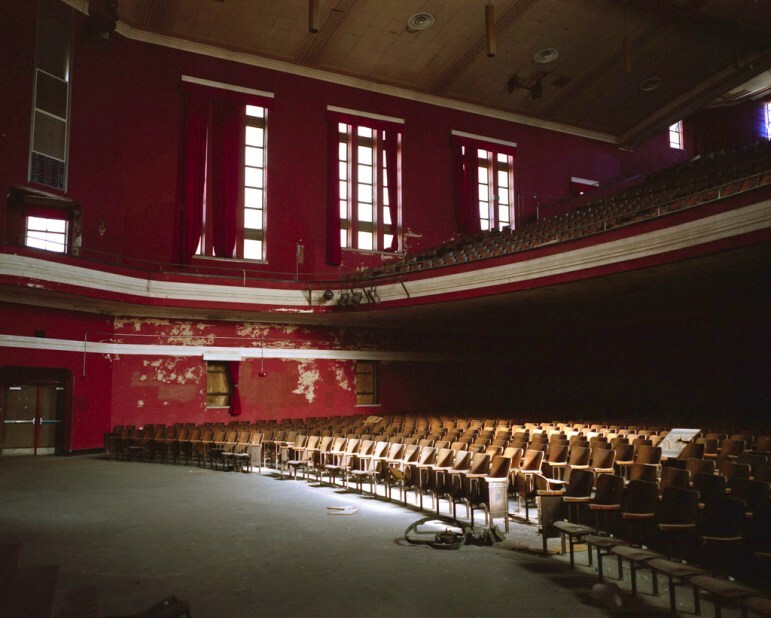 In an era of segregation, the 2,000 seat auditorium served as the city’s black municipal auditorium, hosting the likes of Louis Armstrong, Mahalia Jackson and Dizzy Gillespie, according to the Preservation Resource Center. The National Register is meant to record a historic person, place or theme within its historic setting, explained Dabne Whitemore, a former program director for the Historic Building Recovery Grant Program, part of the U.S. Department of the Interior. When local and state agencies were planning the $51 million rebuilding of Booker T. Washington, they were also figuring out what to do with every other school in the city. Talk of combining Walter L. Cohen, now a charter school, and nearby Booker T. Washington was not met favorably. Cohen charter board member and alumnus Jim Raby opposed the proposed merger. He cited the schools’ historic rivalry, expressed concern about a “mega high school,” and worried about Washington’s location on the former Silver City Dump. After a unique closed-door negotiation in 2015, Cohen got what it wanted: its own renovation. The Recovery School District re-assigned Booker T. Washington to the KIPP network. Money earmarked for KIPP elementary school renovations was promised to Cohen in return. The Washington site required remediation for toxins. This month, crews began working on the auditorium’s exterior, and KIPP reported steel beams had been delivered to the site. But last fall, the Recovery School District realized the auditorium required more work than it initially thought. The RSD asked the state to review whether the site could remain on the historic list or if it should be removed and the auditorium alone listed, according to Jessica Richardson in the State Historic Preservation Office. Back when the state and federal agencies were discussing the renovation, the National Park Service said it would be inappropriate to amend the listing to name the auditorium alone. 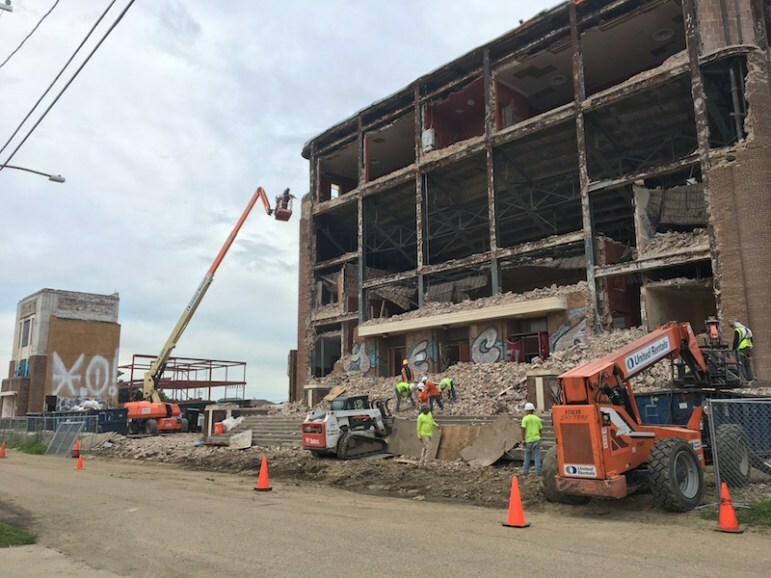 “The current brick masonry on the auditorium is in really terrible shape,” a district employee wrote in an email quoted in a recent state report submitted to remove the school from the register. She said they may not have enough bricks to re-clad the entire auditorium, though they did have enough to do the original entryway to the school. This month, crews removed almost all of the bricks from the auditorium’s southeast wall. That played into the decision to remove the school from the list, but according to a state report, it was practically inevitable once the rest of the school was demolished. The school and auditorium “lost its significance and integrity when the majority of the school building was demolished between 2011 and 2016,” according to the state report. “Today, Booker T. has lost its integrity of design, materials, workmanship, feeling, association, and setting as only a very small portion of the main school is standing and proposed work for the auditorium involved replacing all of the exterior brick with modern brick materials,” the report states. The listing went before the National Register Review Committee in April. The National Park Service reported it as de-listed on June 16. The only consequence, Whitemore said, is that if federal funds are used to repair the building, the school wouldn’t be eligible for additional money or protection to maintain its architectural integrity. Federal funds are being used for the building and were used in the demolition, according to an RSD employee. The National Historic Register will still note that the school was once on the register. The loss of Booker T. Washington doesn’t erase memories. Jones fondly referred to the school as the “lions’ den,” referring to its mascot. As KIPP awaits the move — at this point, it’s supposed to happen over winter break of the 2018-19 school year — its students have already started carrying on the tradition. The first class of lions started last year at an elementary campus that’s expanding until the new building is ready. *Update: This story was updated to reflect that KIPP has opened its high school on another campus.